By 2090, the area burned by forest fires in the European Union could increase by 200% because of climate change. However, preventive fires could keep that increase to below 50%. Improved firefighting response could provide additional protection against forest fires. These findings were the result of modeling work we did for the EU Mediation project on projecting future burned areas and adaptation options in Europe. When we talk about these results, people often want to know more about how our model works, what assumptions it makes, and how reliable it is. Figure 1. The WildFire cLimate impacts and Adaptation Model (FLAM) schematic – estimation of expected burned area. The model is complex: every link in the schematic shown above represents a specific mathematical formula. These formulas have been developed by many researchers who studied how wildfire occurrence is related to climate, population, and biomass available for burning. Their results have been aggregated into mathematical relations and functions attempting to replicate real processes. The model code runs through the scheme with daily weather inputs in order to calculate the potential for fire ignition, spread, and burned areas. The model transforms spatial and intertemporal inputs into expected burned areas for 25km squares across the entirety of Europe. These squares can be summed up into geographic regions, e.g. countries, as well as burned areas can be aggregated over a given time period, e.g. 10 years. It took days for our colleague Mirco Migliavacca to run the model during his work at the Joint Research Center of the European Commission. In fact, the scheme depicted in Figure 1 shows only a small piece of a larger picture reflecting the Community Land Model with the integrated fire module (CLM-AB), which he used. CLM-AB calculates all inputs in the indicated fire module, based on modeling processes in the global vegetation system. To speed up the running times for the case study focused on the wildfires in Europe, my colleague Nikolay Khabarov developed a standalone version of the fire model by decoupling the fire module from CLM-AB. When I joined the study, we had also found alternatives for input data, e.g. IIASA’s Global Forest Database, and implemented additional procedures in order to create our wildfire climate impacts and adaptation model (FLAM). We used the historical data from satellite observations in order to validate modeling results. At the beginning many numerical experiments in CLM and FLAM did not give satisfactory results – there was either overestimation or underestimation of modeled burned areas compared to those reported in available datasets. One day a purely mathematical insight happened. We realized that in the fire algorithm implemented in FLAM, there is a parameter that can be factorized, mathematically speaking. This parameter, a probability of extinguishing a fire in a pixel in one day, was constant for Europe and set to 0.5. It became obvious that this parameter should vary with respect to a region. Factorization of this variable gave a possibility to avoid routine calculations, and use it for calibrating the model over a historical period. This can be done analytically by solving a corresponding polynomial equation. Analytical findings allowed us to introduce an effective calibration procedure and at the same time to estimate a firefighting efficiency on a country level. Further, using the advice of our colleagues Anatoly Shvidenko and Dmitry Schepaschenko, we have introduced adaptation options in the model, for example prescribed burnings, which firefighters use to reduce the fuel availability and, consequently, potential of a major fire. Once we had calibrated the model so that it adequately performed on the historical period (using historical climate data), we used climate scenarios to produce future projections. Currently, we are working on further improvements in modeling accuracy in annual burned areas by introducing additional regionally specific factors in the model. 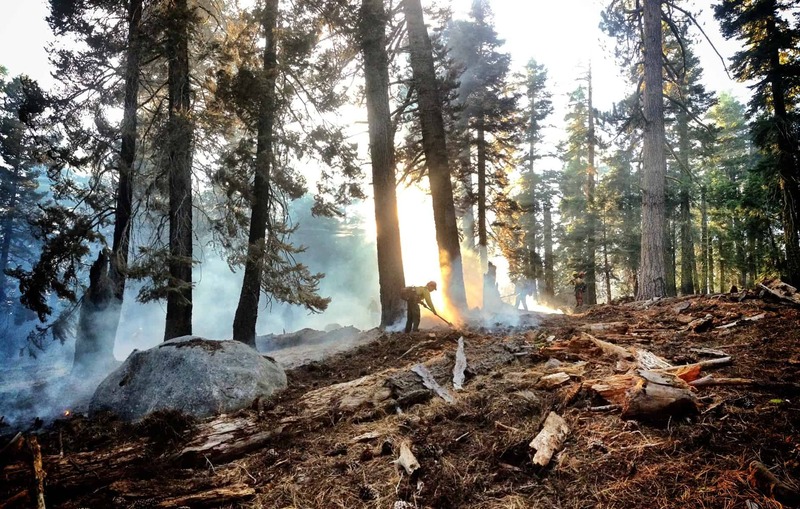 In the recent study published in the International Journal of Wildland Fire, we suggested improving the original model by modifying the fire probability function reflecting fuel moisture. This modification allows for a dramatic improvement of accuracy in modelled burned areas for a range of European countries. Despite some success in modeling annual burned areas in Europe, we still have difficulties in predicting the extreme fires, in particular in some more arid and hence vulnerable regions such as Spain. However, we accept the challenge, because credible modeling results in terms of burned areas provide important information for assessing economic damages and CO2 emissions, due to climate and human activities. Our research has the potential to help society to realize these risks and undertake preventive measures. It also delivers an additional scientific value due to the fact, that fire risks must be included in forest management models. I would like to thank all the study co-authors for their valuable contributions and efficient collaboration. Note: This article gives the views of the interviewee, and not the position of the Nexus blog, nor of the International Institute for Applied Systems Analysis.